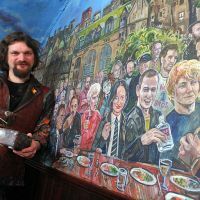 I've known the owners of Edinburgh restaurant A Room In The West End for a number of years as I became friends with Peter Knight while playing with Boroughmuir Rugby Club. 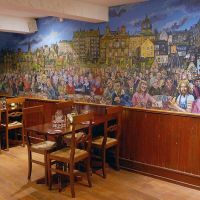 I celebrated my 40th birthday with a meal at the restaurant; the food was great but a previous mural in the subterranean location was looking tired and needed refreshing. 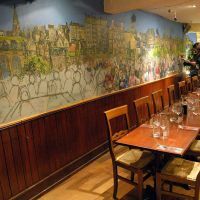 As the wine flowed I apparently told Peter this, and my charming rant must have struck a chord as several years later he called me up to commission a new mural. 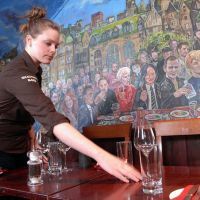 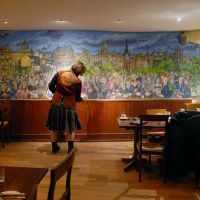 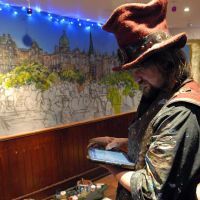 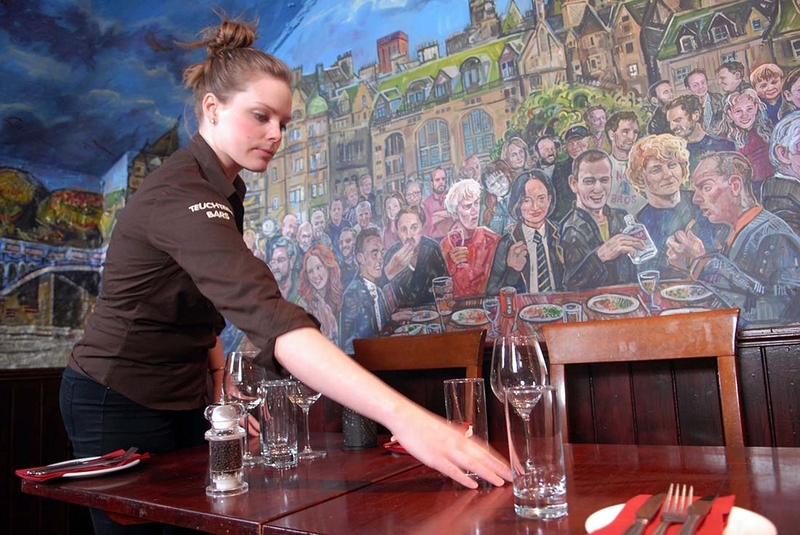 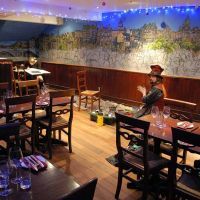 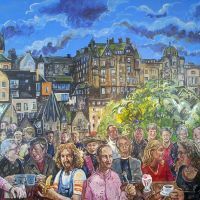 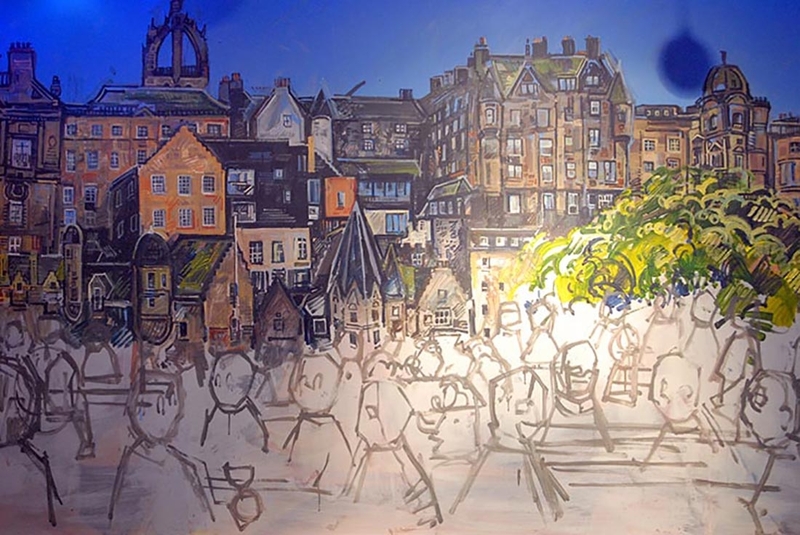 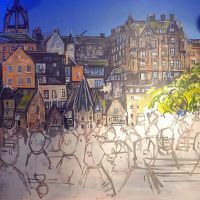 The plan was to build a broader restaurant scene with the Edinburgh’s Old Town as a dramatic backdrop, and the crowd in the scene needed to be busy enough to make the restaurant feel bustling even when it was empty. 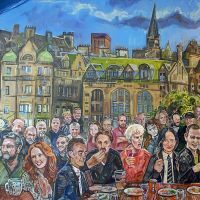 We decided that some customers and staff would be included but ultimately the crowd would be made up of Scottish celebrities. 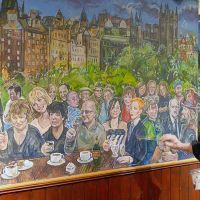 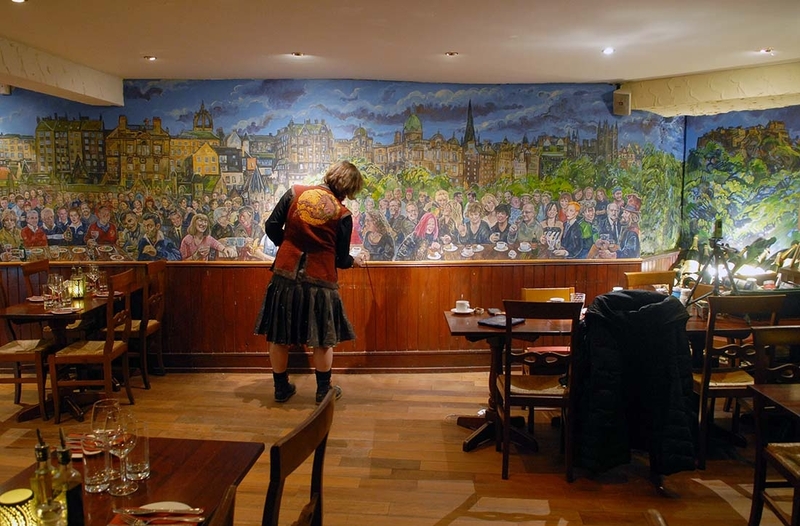 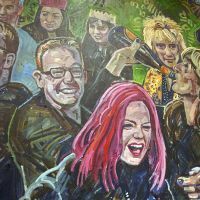 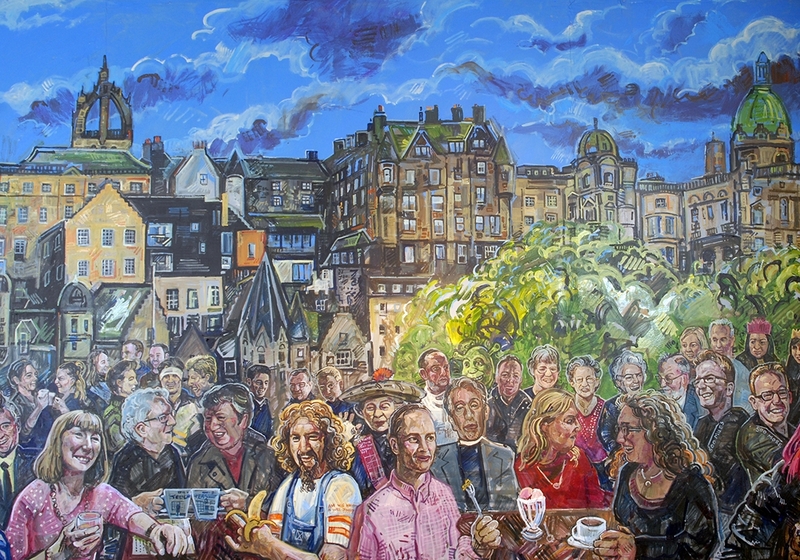 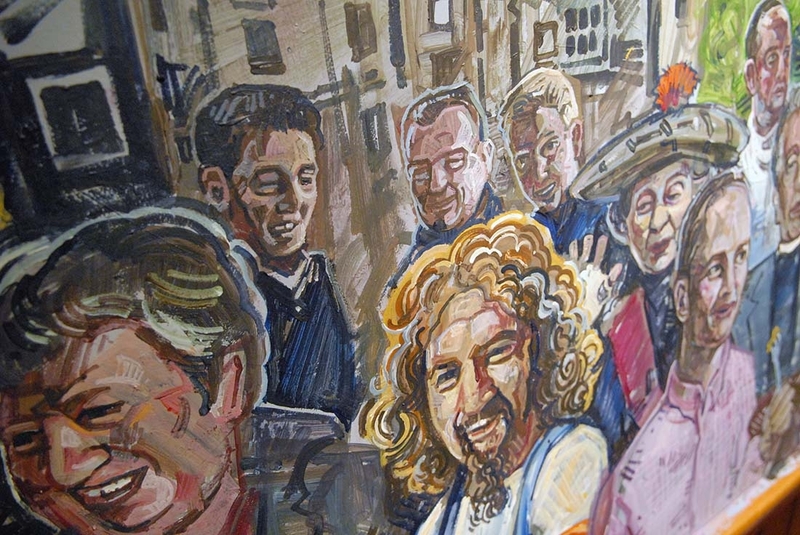 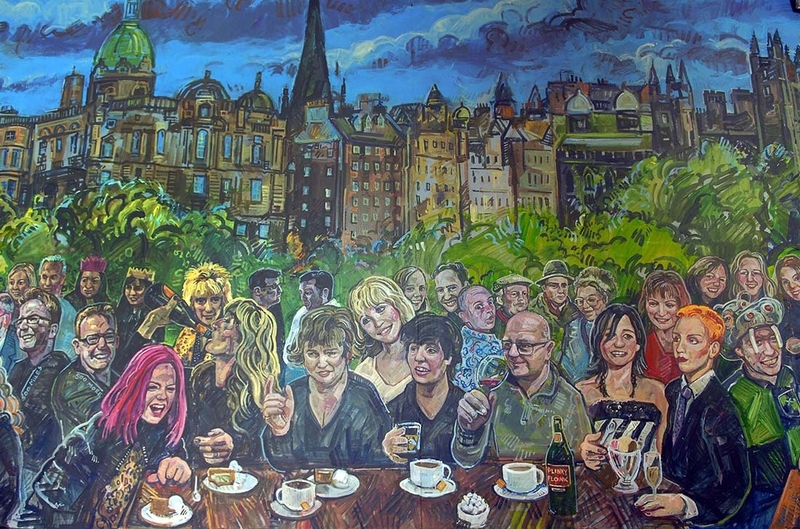 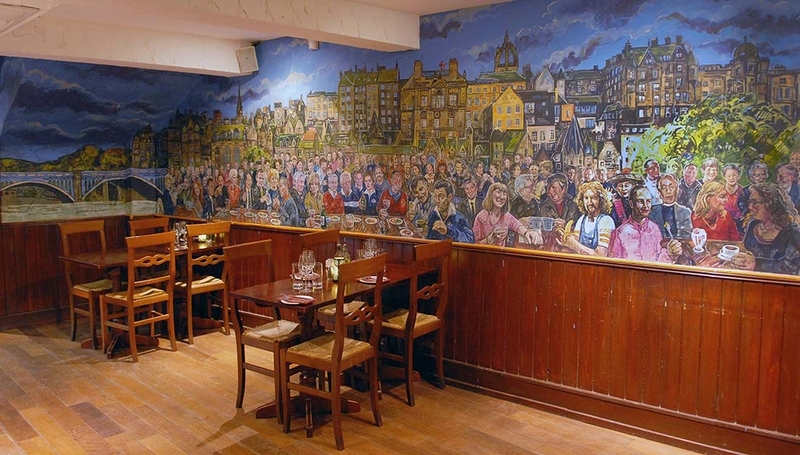 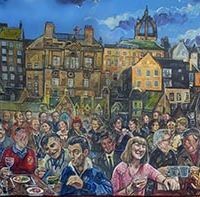 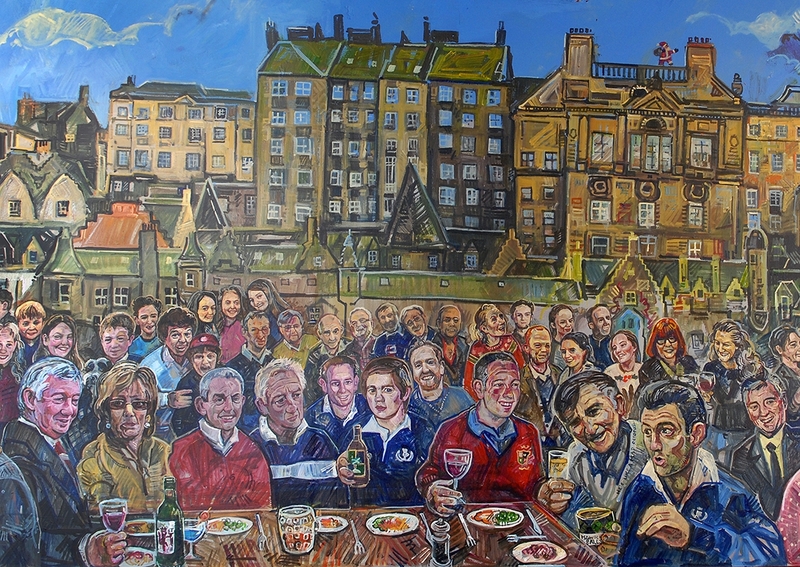 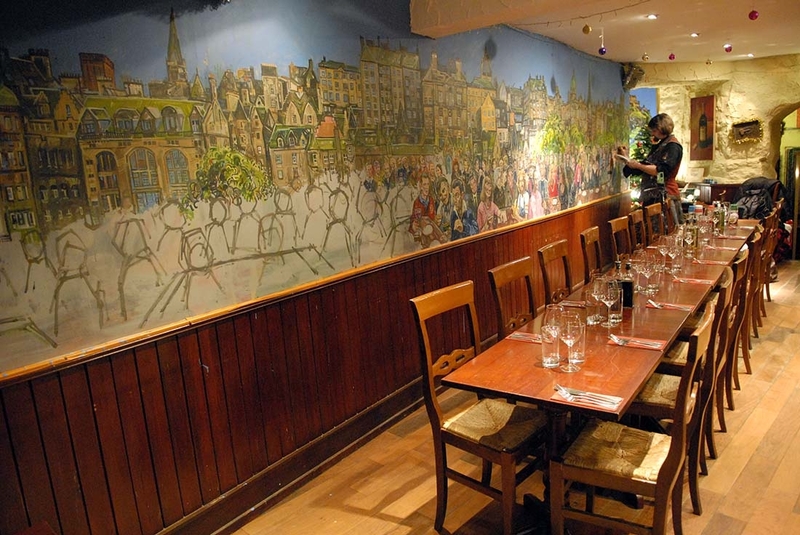 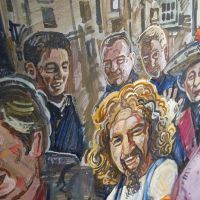 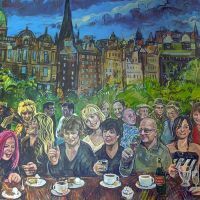 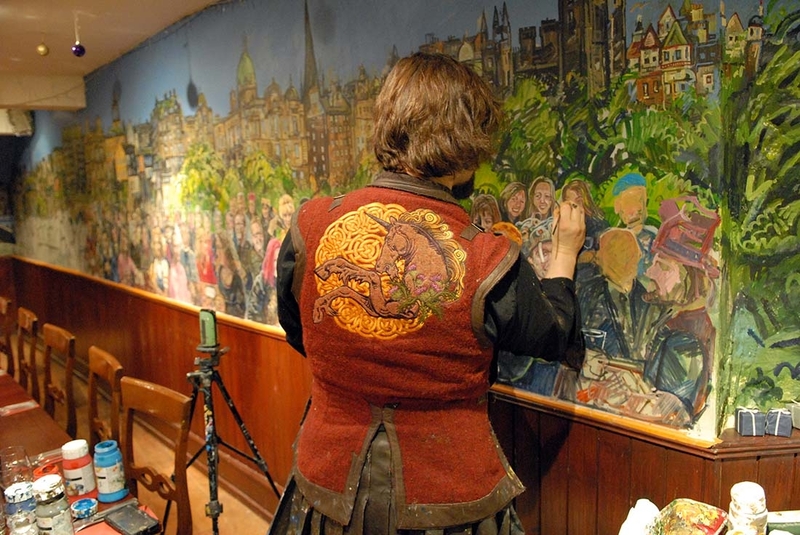 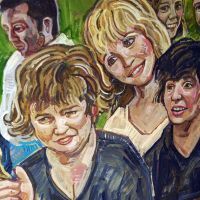 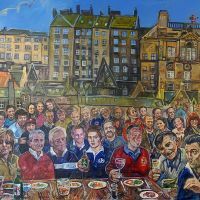 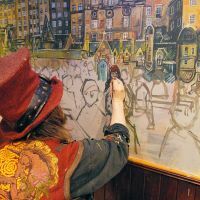 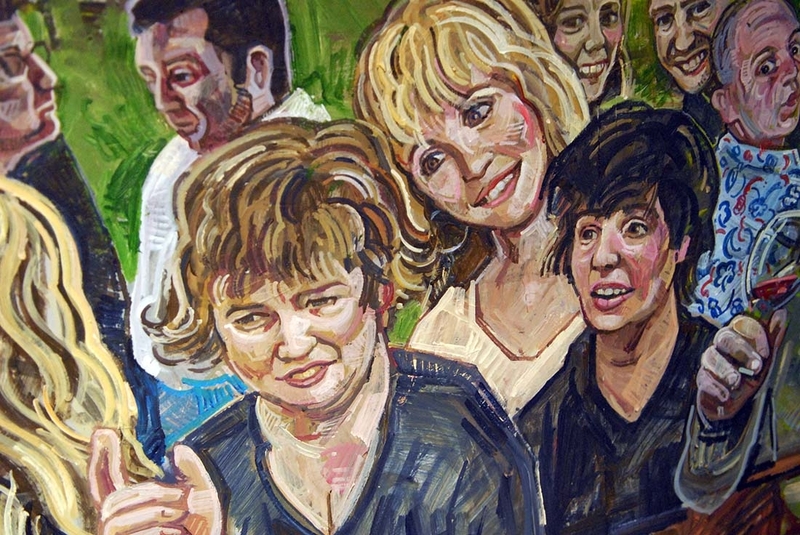 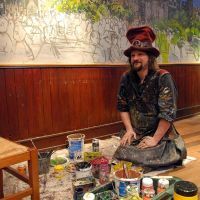 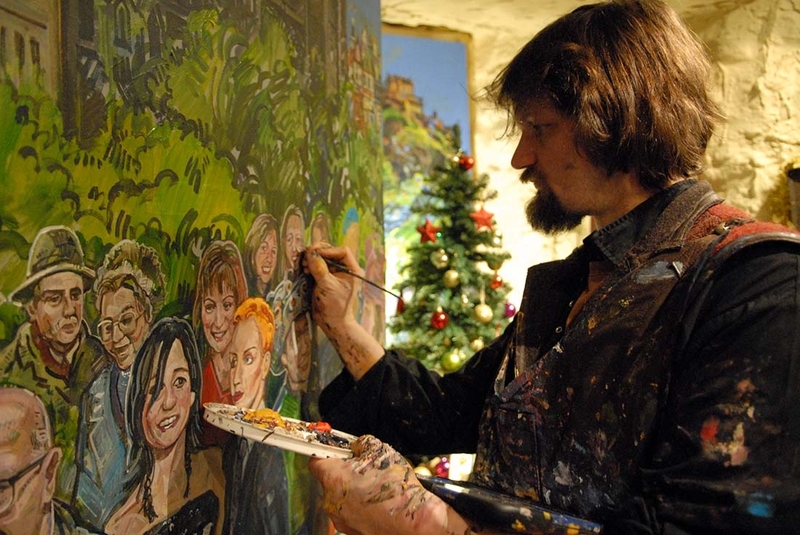 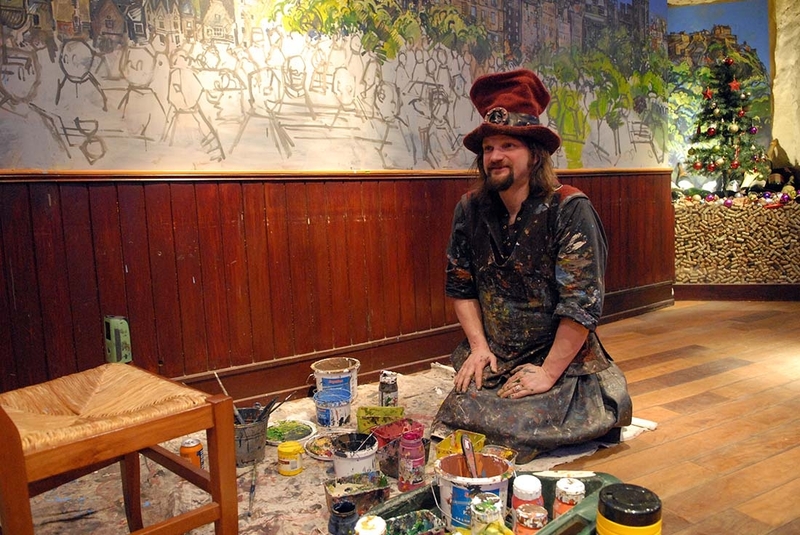 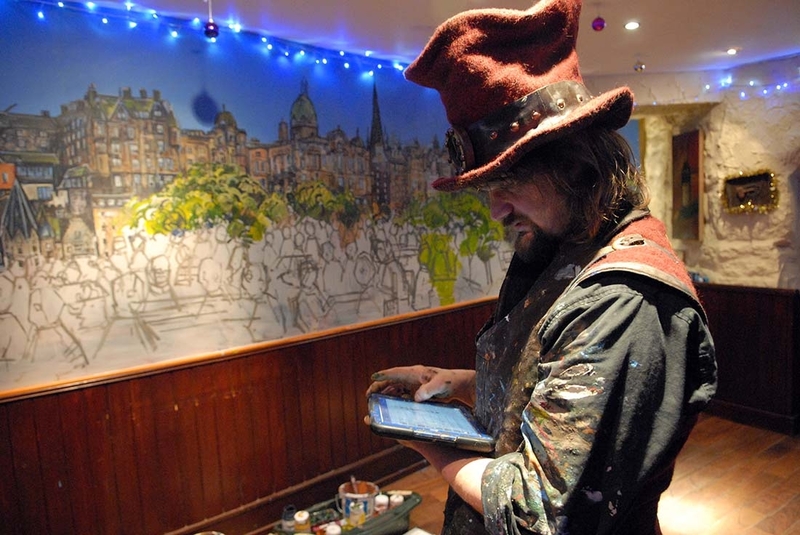 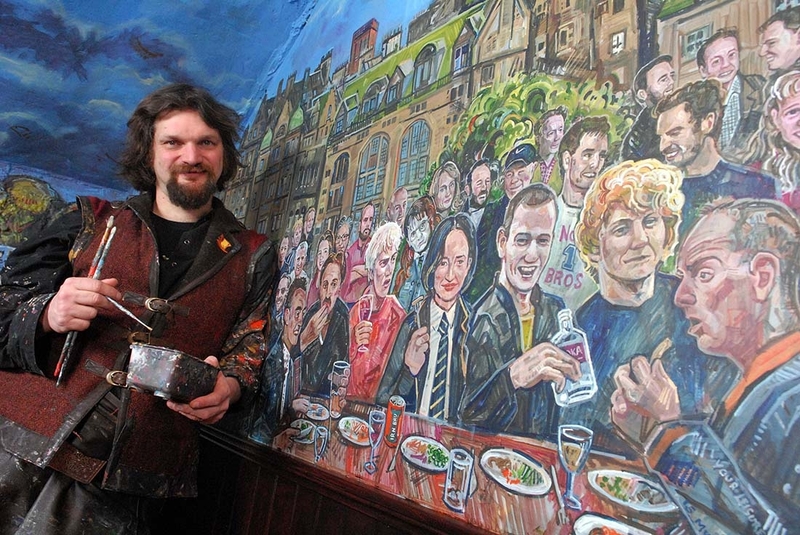 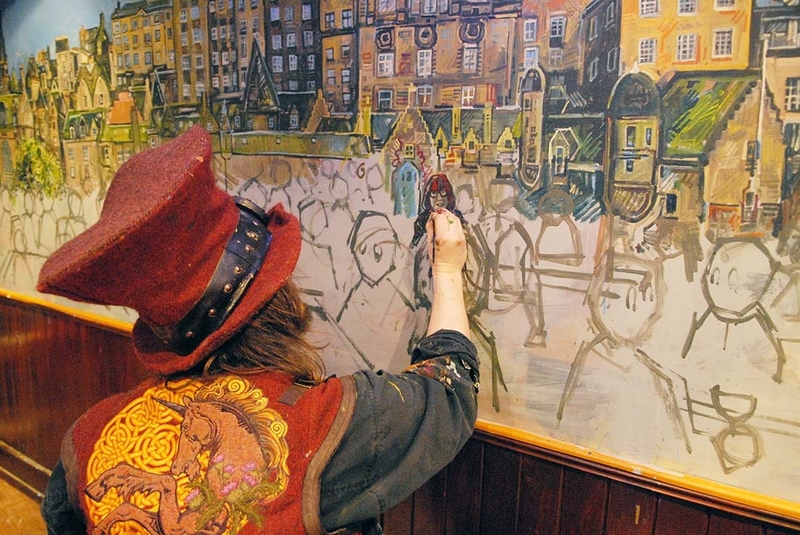 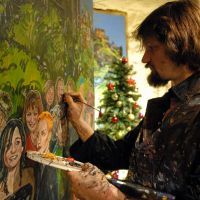 Some of these celebrities would also reflect the rugby heritage of the pub and restaurant, as Teuchters and A Room In The West End are one of Edinburgh’s favourite stops for rugby fans on their way to Murrayfield Stadium. 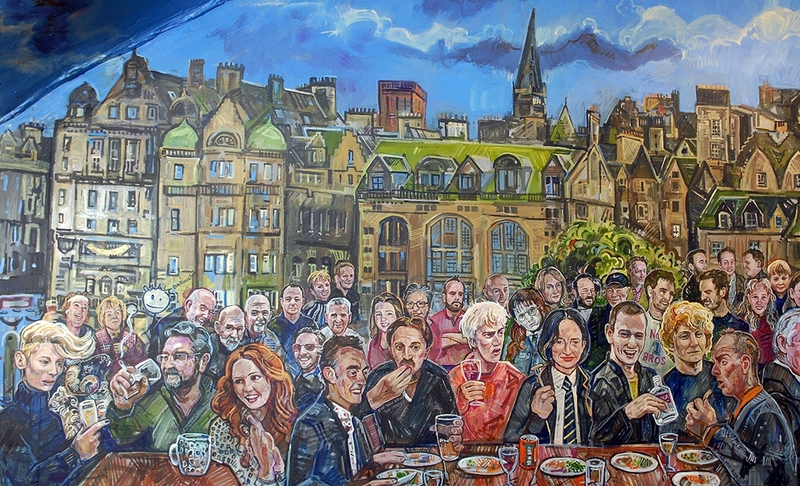 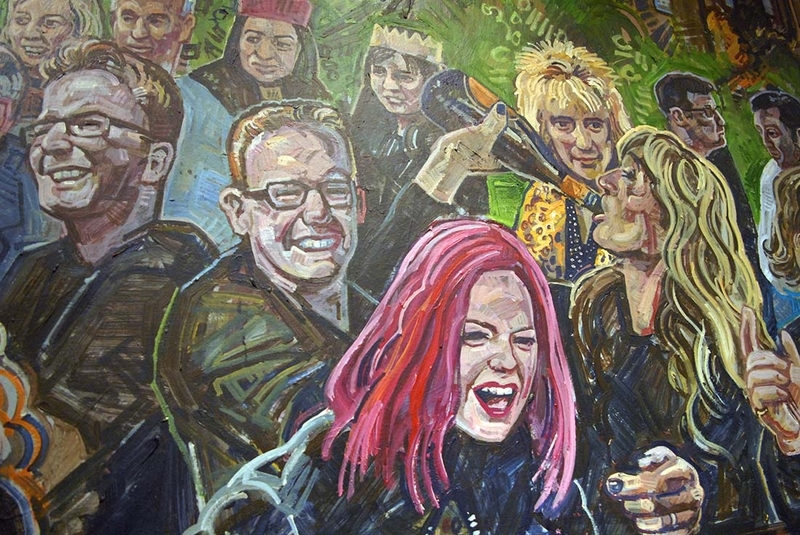 Full list of the celebs featured on the walls of A Room In The West End: Tilda Swinton, Shirley Manson, Sharleen Spiteri, Lulu, Annie Lennox, Susan Boyle, Lorraine Kelly, Rod Stewart, The Proclaimers, The cast of Still Game, Andy Murray, Jamie Murray, Danny Boyle, Kelly MacDonald, Shirley Henderson, J.K. Rowling, Ewan McGregor, Ewen Bremner, Jonny Lee Miller, Robert Carlyle, Kevin McKidd, Sean Connery, Princess Anne, Billy Connolly, Alex Ferguson, Bill McLaren, Scott Hastings, Gavin Hastings, John Jeffrey, David Sole, Jim Telfer, Ian McGeechan, Andy Irvine, The Krankies, Rikki Fulton, Karen Gillan, Super Gran, Shrek, Rab C. Nesbitt (Gregor Fisher) & Mary Doll (Elaine C. Smith). 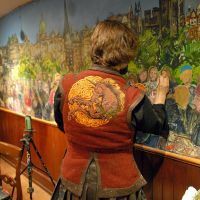 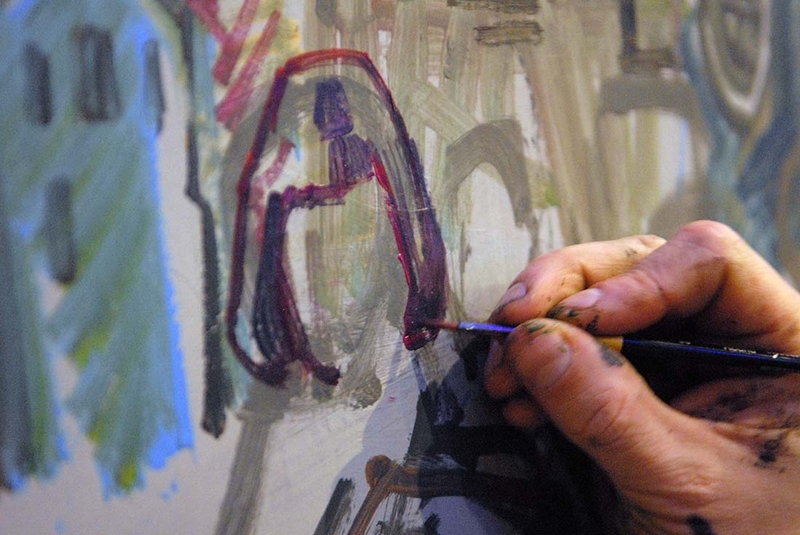 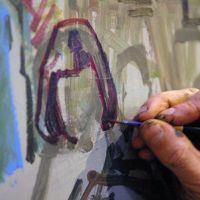 For more information on the progression of the project, read our blog post. 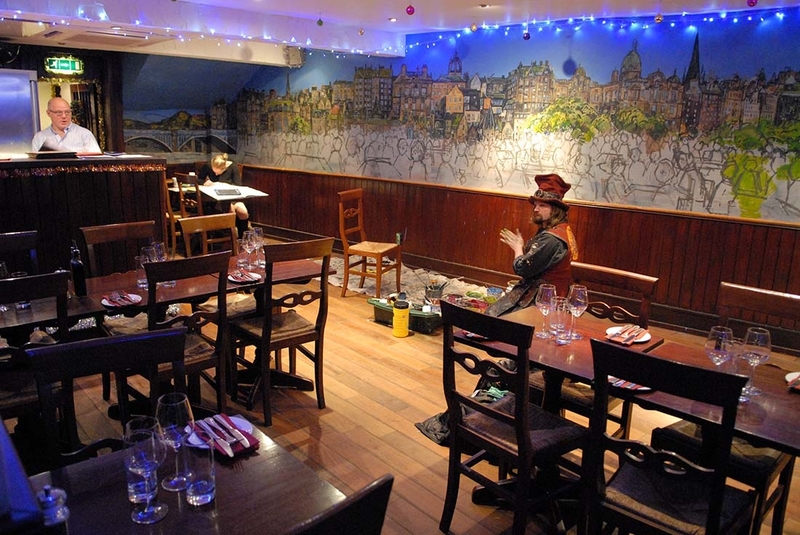 A Room In The West End is located at 26 William St, Edinburgh EH3 7NH (downstairs from Teuchters pub).